Please note: Commercial waste is chargable at all sites. All vans and trailers must bring proof of address. For more information on commercial waste visit: www.eastlothian.gov.uk. We do not accept food waste, tyres or asbestos at the Recycling Centres. The recycling centres are closed 25th and 26th December and 1st and 2nd January, and will close at the earlier time of 2pm on Christmas Eve and Hogmanay. You may be asked for proof of address to access our sites. 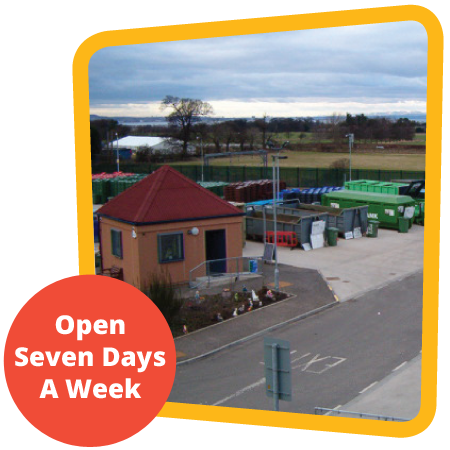 There are over 70 Recycling points across East Lothian where you can recycle glass, cans, paper and textiles. To find out what you can recycle and where, visit www.recycleforscotland.com. Commercial vehicles, vans and trailers are restricted to access sites 8.30am – 10.30am. Commercial customers must present their waste carriers licence and recycling permit where applicable when asked.